Back row, from left, Adopt-A-Dog Executive Director Kristen Alouisa, state Rep. Laura Devlin, Kevin Caskin of Peoples United Bank, Director of Community and Economic Development Mark Barnhart and Fairfield Chamber of Commerce President Beverly Balaz. Front row, from left, Adopt-a-Dog staff member Brian Gordiski, Pet Pantry co-owner Ari Jacobson, First Selectman Michael Tetreau, state Rep. Cristin McCarthy Vahey, Giulia Tetreau, and Pet Pantry co-owner Adam Jacobson. On Sept 5., Pet Pantry hosted the firstsSelectman, town legislators and the Chamber of Commerce to a "ribbon chewing" ceremony with an Adopt-a-Dog event. The Fairfield Chamber of Commerce has announced its annual fall Harvest Market will take place on the Old Town Hall Green on Oct. 14 from 10 a.m. to 4 p.m., and is now accepting vendor applications. Clothiers, jewelers, artisans and others will display their products and items to the public. Last year, the event featured more than 50 well-known and unique retail vendors, a farmers market, costume dog parade, and a variety of food trucks, while shoppers strolled along enjoying music provided by DJ Scott. The Chamber is encouraging vendors to contact them as soon as possible, as spots fill up quickly. The event is free and open to the public. For information, email Krista@FairfieldCTChamber.com, visit www.FairfieldCT Chamber.com, or call the Chamber office at 203-255-1011. Operation Hope of Fairfield will host its annual Golf Outing fundraiser on Oct. 1 at the Country Club of Fairfield, raising funds for the organization to continue providing a combination of clinical support, housing affordability and hope for the future for those experiencing homelessness. Foursomes and individual players are welcome. Golfers will enjoy 18 holes of golf, along with a delicious lunch buffet, cocktails, hors d’oeuvres, carving stations, awards and an auction. Registration begins at 10:30 a.m., lunch is at 11:15 a.m. and tee-off is at 12:30 p.m. The cocktail party is from 5:30 t o7:30 p.m.
Business and individual sponsorships are still available. Visit bit.ly/ohgolf2018, or contact Director of Development Jennifer O’Neill at joneill@operationhopect.org or 203-292-5588 for more information and to register by phone or email. Green’s Farms Garden Club invites the public to attend an open meeting on Oct. 2 at 10:30 a.m. at The Grange in Fairfield, 1873 Hillside Road. Margery Winters, assistant director of Roaring Brook Nature Center, will speak on the topic “The Wood Wide Web: How Plants Communicate.” Winters received her formal education in geography/geology and also has a master’s degree from Queen’s University in Canada. A master landscape design consultant, Winters is an expert in native plant gardens. There is no charge to attend her talk, which will be followed by refreshments. Backyard feeding contributes to the health and survival of birds during the colder months. Stock up for the season with premium bird seed that will be 20 percent off at the Connecticut Audubon Society’s annual Fall Bird Seed Sale on Sept. 29. Most birds that winter in Connecticut are seed eaters. Seed and suet provide the calories and nourishment they need to stay warm and healthy as the cold weather approaches and food becomes scarce. Good choices for food include black oil sunflower seed, safflower seeds (squirrels and grackles don’t like it), Nyjer and suet — a great energy source. The Connecticut Audubon Society’s Center at Fairfield Nature Store offers a wide selection of bird seed for attracting the greatest variety of birds to your feeder. Knowledgeable staff are always available to offer guidance on seed choice and feeder selection, and to answer general bird-feeding questions. All purchases will support The Connecticut Audubon Society’s environmental conservation and education programs. The Center at Fairfield Nature Store, at 2325 Burr St. in Fairfield, is open Monday through Saturday, 10 a.m. to 3 p.m.
For information, call the Center at Fairfield Nature Store, 203-259-6305, ext.109. Southport Galleries has been chosen by the artist John “Crash” Matos as part of the international, fall tour of his latest evolution, “Coming Full Circle” showcasing his creative energy in a newly discovered format of round canvases. Coming of age in the 1970s Bronx, Matos’ distinctive style and bold signature fueled the graffiti movement in New York City’s subways, rail yards and building facades. Soon he translated his explosive, spray-painted outdoor expression onto canvas to become one of America’s most collected artists. Matos’ return to Southport Galleries is full circle indeed, beginning when he stopped traffic and “tagged” the gallery window on Pequot Avenue in 2014. Meet the artist on Sept. 21 from 5 to 8 p.m. The reception is free and open to the public. The exhibition continues until Oct. 21. Pet Pantry Warehouse opened the doors to their seventh location at 1876 Blackrock Turnpike in Fairfield in July. The family owned and operated store is approximately 3000 square feet and features a hand-selected range of products and pet food brands that support animal health and well-being. The business is also equipped with a passionate staff that is thoroughly trained and tested in pet nutrition. In August, the store held a Yappy Hour event at Little Pub in Fairfield. All drink proceeds were donated to the Pet Pantry partner charity. 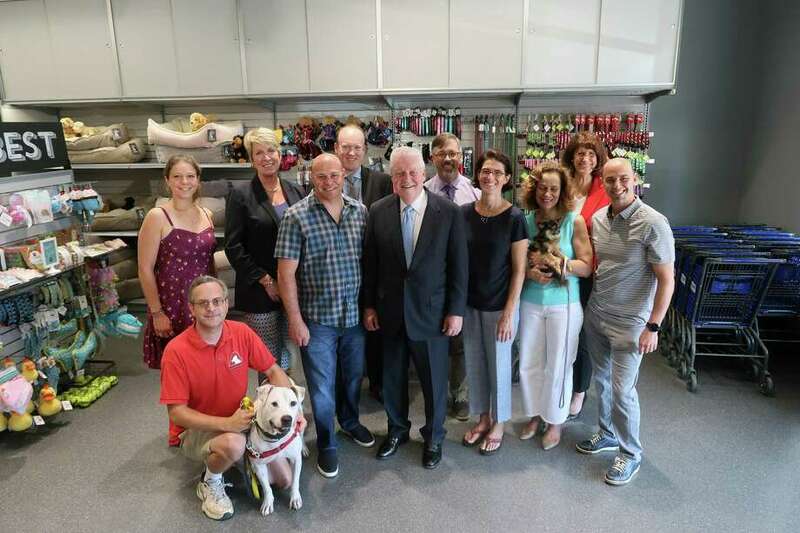 On Sept. 5, Pet Pantry also hosted the First Selectman, town legislators and the Chamber of Commerce for a “ribbon chewing” and Adopt-a-Dog event. Pet Pantry customers can expect help selecting the correct pet food and formula to meet their individual animal companions’ needs for optimum health. In addition to human-grade dog food options, Pet Pantry’s Fairfield customers will also have access to a self-service pet wash. The pet wash is intended to be a convenience to clients, but will also be a fundraising opportunity for local schools, animal adoption agencies, and other worthy local causes. Visit Pet Pantry Warehouse online for a complete list of products and brands offered. For event information, specials and the latest news follow Pet Pantry on social media @ppwpet and subscribe to the e-newsletter.